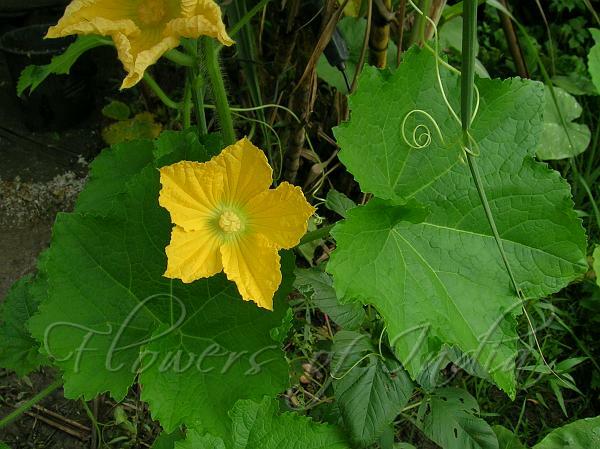 White gourd is a vine grown for its very large fruit, eaten as a vegetable. The fruit is fuzzy when young. By maturity, the fruit loses its hairs and develops a waxy coating, giving rise to the name wax gourd, and providing a long shelf life. Stem is much branched. Leaf stalks are long and hairy. Leaves roundish, kidney-shaped, base deeply heart-shaped. Upper surface is rough, lower surface shortly bristly, blade 10-25 cm long and as much broad, 5-7-lobed, lobes ovate-triangular, margin sinuate or toothed. Tendrils are slender, rarely simple. Male flower 5-15 cm long, female 2-4 cm long. Calyx tube 10-15 mm long, densely hairy, lobes lanceolate, acute, 6-12 mm long. Petals spreading, blunt, but ending in a short point, 3-5 x 2-4 cm. Filaments of the stamens are inflated and hairy at the base, anthers trilobed. In north India, the fruit is used in making the popular sweet पेठा petha. Identification credit: Lakshmanan Iyer Photographed in Imphal, Manipur.